Ulnar collateral ligament reconstruction, also known as Tommy John surgery (TJS), is a surgical graft procedure where the ulnar collateral ligament in the medial elbow is replaced with either a tendon from elsewhere in the patient's body, or tendon from donated tissue of a cadaver. The procedure is common among collegiate and professional athletes in several sports, particularly in baseball. The procedure was first performed in 1974 by orthopedic surgeon Frank Jobe, a Los Angeles Dodgers team physician who served as a special advisor to the team until his death in 2014. It is named after the first baseball player to undergo the surgery, major league pitcher Tommy John, whose record of 288 career victories ranks seventh among left-handed pitchers. The initial operation, John's successful post-surgery career, and the relationship between the two men is the subject of a 2013 ESPN 30 for 30 documentary. 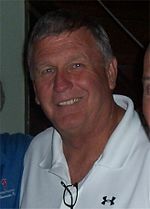 Tommy John, for whom the surgery is named, in 2008. At the time of John's operation, Jobe put the chances for success of the operation at 1 in 100. In 2009, prospects of a complete recovery had risen to 85–92 percent. Following his 1974 surgery, John missed the entire 1975 season rehabilitating his arm before returning for the 1976 season. Before his surgery, John had won 124 games. He won 164 games after surgery, retiring in 1989 at age 46. The ulnar collateral ligament (UCL) can become stretched, frayed, or torn through the repetitive stress of the throwing motion. The risk of injury to the throwing athlete's UCL is thought to be extremely high as the amount of stress through this structure approaches its ultimate tensile strength during a hard throw. This injury is associated with baseball, although it sometimes appears in other sports. Compared to athletes who play other sports, baseball players are at higher than average risk of overuse injuries and injuries caused by early sports specialization among children and teenagers. While some sources say that an individual's style of throwing or the type of pitches they throw are the most important determinant of their likelihood to sustain an injury, the results of a 2002 study suggest that the total number of pitches thrown is the greatest determinant. A 2002 study examined the throwing volume, pitch type, and throwing mechanics of 426 pitchers aged 9 to 14 for one year. Compared to pitchers who threw 200 or fewer pitches in a season, those who threw 201–400, 401–600, 601–800, and 800+ pitches faced an increased risk of 63%, 181%, 234%, and 161% respectively. The types of pitches thrown showed a smaller effect; throwing a slider was associated with an 86% increased chance of elbow injury, while throwing a curveball was associated with an increase in pain. There was only a weak correlation between throwing mechanics perceived as bad and injury-prone. Thus, although there is a large body of other evidence that suggests mistakes in throwing mechanics increase the likelihood of injury it seems that the greater risk lies in the volume of throwing in total. Research into the area of throwing injuries in young athletes has led to age-based recommendations for pitch limits for young athletes. A 2016 study explained 22% of the variation in those needing ulnar collateral ligament reconstruction, citing handedness, standard deviation of release point, days lost to arm and shoulder injuries, previous ulnar collateral ligament reconstruction, number of hard pitches, ERA-, and age as the known risk factors. In younger athletes, whose epiphyseal plate (growth plate) is still open, the force on the inside of the elbow during throwing is more likely to cause the elbow to fail at this point than at the ulnar collateral ligament. This injury is often termed "Little League elbow" and can be serious but does not require reconstructing the UCL. Increasingly often, pitchers require a second procedure after returning to pitching – the periods from 2001–2012 and 2013–2015 both saw eighteen Major League pitchers receiving the procedure a second time. As of April 2015, the average amount of time between procedures is 4.97 years. A 3–4 inch surgical incision is made near the elbow. Holes to accommodate a replacement graft tendon are drilled in the ulna and humerus bones of the elbow. A harvested tendon, such as the palmaris tendon from the forearm of the same or opposite elbow, the patellar tendon, hamstring, toe extensor or a donor tendon (allograft), is then woven in a figure-eight pattern through the holes and anchored. The ulnar nerve is usually moved to prevent pain as scar tissue can apply pressure to the nerve. The procedure is done on an outpatient basis allowing a return to home the same day, with the arm in a splint to protect the repair for the first week. After one week, a brace is employed to protect the reconstruction for about six weeks following surgery. There is a risk of damage to the ulnar nerve. Some baseball pitchers believe they can throw harder after ulnar collateral ligament reconstruction than they did beforehand. As a result, orthopedic surgeons have reported that parents of young pitchers have come to them and asked them to perform the procedure on their un-injured sons in the hope that this will increase their sons' performance. However, many people—including Frank Jobe—believe any post-surgical increases in performance are most likely due to the increased stability of the elbow joint and pitchers' increased attention to their fitness and conditioning. Jobe believed that, rather than allowing pitchers to gain speed, the surgery and rehab protocols merely allow pitchers to return to their pre-injury levels of performance. Over the last two decades, the number of UCLR surgeries has increased 3–fold, an incidence expected to rise in upcoming years. A study of youths who underwent UCLR surgery showed that boys and girls aged 15 to 19 had more surgical procedures than any other age group, with the rate of surgeries performed on 15 to 19 year olds increasing by 9% per year. USA Baseball, Major League Baseball and Little League Baseball have initiated the Pitch Smart program designed to decrease risk of elbow injuries in adolescent pitchers. The main risk factors for elbow injury from overhand throwing include number of pitches per game, innings pitched per season, months pitched per year and poor pitching biomechanics which may increase torque and force on the elbow. ^ Grantland staff (July 23, 2013). "30 for 30 Shorts: Tommy and Frank". Grantland. Retrieved August 17, 2013. ^ "Frank Jobe's Hall of Fame Life". Major League Baseball. 22 July 2013. Retrieved March 7, 2014. ^ Rosenhek, Eric (July 1, 2009). "The gory details of Tommy John surgery". The Good Point. Retrieved April 6, 2014. ^ Dodd, Mike (July 29, 2003). "A year of rehab for Tommy John patients". USA Today. ^ a b Verducci, Tom. "The post-Tommy John surgery calculus that is changing the game". Sports Illustrated (April 21, 2015). Retrieved 21 April 2015. ^ Fleisig, G.S., The biomechanics of baseball pitching, in Biomechanical Engineering. 1994, University of Alabama: Birmingham. p. 163. ^ Lyman, Stephen; Fleisig, Glenn S.; Andrews, James R.; Osinski, E. David (2002). "Effect of Pitch Type, Pitch Count, and Pitching Mechanics on Risk of Elbow and Shoulder Pain in Youth Baseball Pitchers". The American Journal of Sports Medicine. 30 (4): 463–8. doi:10.1177/03635465020300040201. PMID 12130397. ^ Whiteley, Rod (2007). "Baseball throwing mechanics as they relate to pathology and performance – A review" (PDF). Journal of Sports Science and Medicine. 6 (1): 1–20. doi:10.1111/j.1600-0838.1996.tb00062.x. ^ Lyman, Stephen; Fleisig, Glenn S.; Waterbor, John W.; Funkhouser, Ellen M.; Pulley, Leavonne; Andrews, James R.; Osinski, E. David; Roseman, Jeffrey M. (2001). "Longitudinal study of elbow and shoulder pain in youth baseball pitchers". Medicine and Science in Sports and Exercise. 33 (11): 1803–10. doi:10.1097/00005768-200111000-00002. PMID 11689728. ^ Tommy John epidemic in MLB? ^ "Predicting Tommy John Surgeries". MLB Trade Rumors. Retrieved 2016-04-07. ^ a b Carroll, Will. "Dr. Frank Jobe, Tommy John and the Surgery That Changed Baseball Forever". Bleacher Report. Turner Broadcasting System, Inc. Retrieved July 17, 2013. ^ Purcell, Derek B; Matava, Matthew J; Wright, Rick W (2007). "Ulnar Collateral Ligament Reconstruction". Clinical Orthopaedics and Related Research. 455: 72–7. doi:10.1097/BLO.0b013e31802eb447. PMID 17279038. ^ Longman, Jere (July 20, 2007). "Fit Young Pitchers See Elbow Repair as Cure-All". nytimes.com. Retrieved October 23, 2013. ^ Keri, Jonah (September 13, 2007). "Interview With Dr. Frank Jobe". ESPN.com. Retrieved October 13, 2008. ^ Mahure, S. A.; Mollon, B; Shamah, S. D.; Kwon, Y. W.; Rokito, A. S. (2016). "Disproportionate trends in ulnar collateral ligament reconstruction: Projections through 2025 and a literature review". Journal of Shoulder and Elbow Surgery. 25 (6): 1005–12. doi:10.1016/j.jse.2016.02.036. PMID 27197888. ^ Erickson, B. J.; Nwachukwu, B. U.; Rosas, S; Schairer, W. W.; McCormick, F. M.; Bach Jr, B. R.; Bush-Joseph, C. A.; Romeo, A. A. (2015). "Trends in Medial Ulnar Collateral Ligament Reconstruction in the United States: A Retrospective Review of a Large Private-Payer Database from 2007 to 2011". The American Journal of Sports Medicine. 43 (7): 1770–4. doi:10.1177/0363546515580304. PMID 26129959. ^ "Pitch Smart". Major League Baseball. 2016. Retrieved 26 October 2016. ^ Fleisig, G. S.; Andrews, J. R. (2012). "Prevention of Elbow Injuries in Youth Baseball Pitchers". Sports Health: A Multidisciplinary Approach. 4 (5): 419–424. doi:10.1177/1941738112454828. PMC 3435945. PMID 23016115. This page was last edited on 14 December 2018, at 16:20 (UTC).